InfoTrack, an award-winning Australian technology company, provides intelligent search and automated workflows for companies across the professional services industry. InfoTrack, an award-winning Australian technology company, provides intelligent search and automated workflows for companies across the professional services industry. The company’s SaaS solutions can be seamlessly integrated into third-party practice management, document management, and accounting systems to help customers quickly find information pertaining to property, company, personal, and other search data that use built-in electronic signature capabilities to help further streamline workflows. Founded in 2001, InfoTrack functioned primarily as an aggregator of information for several years, pulling together data from government authorities and other sources into a single, searchable repository. This was the company’s “bread and butter” for some time, and InfoTrack did it well, adding new data sources and serving new industries as the company rapidly grew. Richard Morwood, manager of big data, was tasked with building a technology platform that could support the board’s vision. He knew from prior experience that he would use Amazon Web Services (AWS), which would give the company all the core services needed for a scalable big data platform in the cloud, and set out to find the right tools for bringing it all together. Morwood selected Matillion ETL for Amazon Redshift, a solution from Matillion, an Advanced Technology Partner of the Amazon Partner Network (APN). Delivered as an Amazon Machine Image (AMI) via the AWS Marketplace, Matillion ETL for Amazon Redshift unlocks the power of the fully managed Amazon Redshift data warehouse service by simplifying data loading, transformation, and orchestration through a full-featured, browser-based, graphical job development environment. Since adopting AWS and Matillion, InfoTrack has used the combined big data platform to introduce two products. Following is an architectural diagram for the first project, a United States Property Search service, which enables users to quickly find a property, view basic information in it, and, if desired, order a report that provides additional detail—such as the property’s owner or whether there are any liens against it. ● Daily updates from an external data provider are captured in Amazon Simple Storage Service (Amazon S3), after which the “daily delta” is captured in Amazon Redshift staging tables. ● Matillion ETL for Amazon Redshift orchestrates data clean-up and correlates property ownership to addresses, then loads that information into the main data warehouse running on Amazon Redshift. ● Information in the main data warehouse is pushed to two places: Amazon Elasticsearch Service (Amazon ES), which provides an indexed data catalog and powers the search box on the public website; and Amazon Aurora, which stores all the details for each property. ● When a user selects a property via the search box, Amazon ES retrieves the detailed property data from Amazon Aurora via Amazon API Gateway, which in turn calls an AWS Lambda function to access the database. Continuous integration/continuous delivery (CI/CD) is achieved through the use of AWS CodePipeline and AWS CodeBuild, with deployment handled by AWS CloudFormation. “Our current United States Property Search solution matches address-to-owner,” says Morwood. “We’ll soon be delivering additional products from the same data set, using the same architecture. ● Powerful ETL tools. 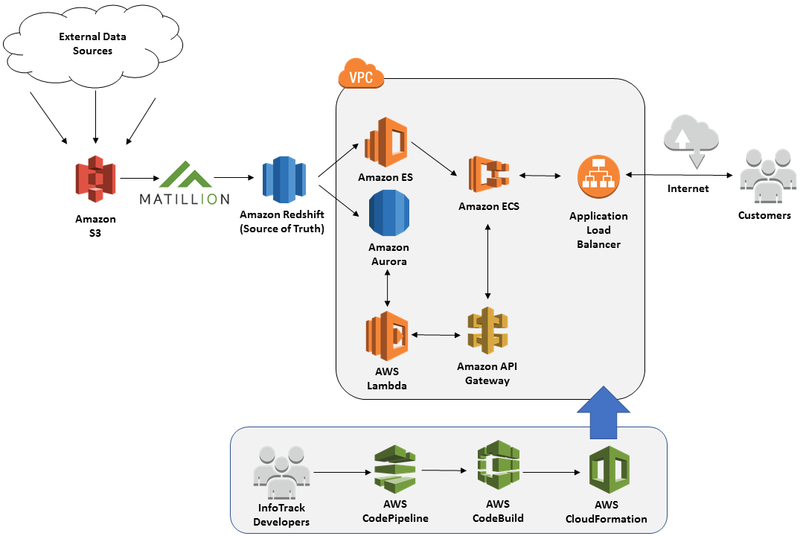 Matillion ETL for Amazon Redshift gives InfoTrack a comprehensive tool-set for putting the power of Amazon Redshift to use. With it, the company can easily load data from a broad range of sources, transform it at impressive speed; fully orchestrate data movement; integrate with other AWS services; and maintain comprehensive version control. And because it runs as an AMI, Matillion ETL for Amazon Redshift can be scaled as easily as the underlying Amazon Redshift cluster. Matillion, an AWS Partner Network (APN) Advanced Technology Partner, are fundamentally changing data integration enabling our customers to innovate at the speed of business, with cloud-native data integration technology including Matillion ETL for Amazon Redshift - the data integration tools that makes loading and transforming data on Amazon Redshift fast, easy, and affordable. Available on AWS Marketplace. Matillion. Data integration, at your service. For more information about how Matillion can help your company build and manage your AWS environment, see Matillion’s listing in the AWS Partner Directory. To learn more about AWS Data Warehouse solutions, visit our Amazon Redshift page.